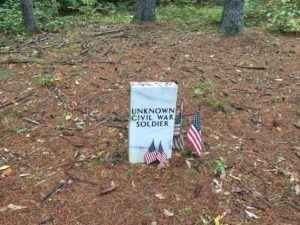 Here is the account of New Hampshire Unknown Civil War Soldier, courtesy of State of New Hampshire, Bear Brook State Park. 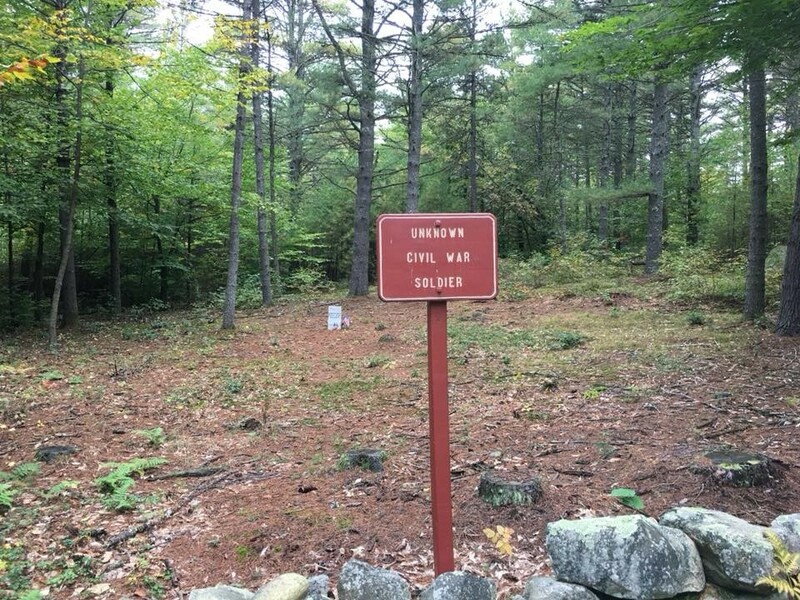 On May 1, 2008 I received a request from Norman Chaput, a local hunter who frequented the Bear Brook State Park area, to research a veteran’s grave on Podunk Road. He said a US Flag would be placed each year for Memorial Day. I contacted the American Legion and the Veteran’s of Foreign Wars posts in Sun cook Village to find out who places the flags. I was informed that for decades Mr. Ernest Petit volunteered to do this in both Allenstown and Pembroke cemeteries. Unfortunately Mr. Petit died on July 23, 2006 and did not leave behind a list of Veteran burials,he placed those flags by memory. Some of Mr. Petit’s friends said that he knew it was a civil war soldier, but did not know his name. 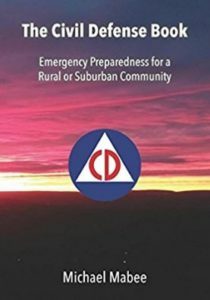 I visited the survey section at State of New Hampshire – DRED and looked through dozens of maps of the Allenstown Area. On an old map I found where a 100 ft. square area was marked as a cemetery in the general area the flag had been placed. I asked Mr. Chaput and other hunters to see if this appears to be the right spot and they all agreed this was it. 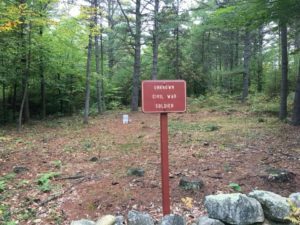 I returned to N.H. DRED and asked the survey crew to plot this area and mark it. I did diagonals of their survey to find the center, and this is where the monument is located. It may not be the exact spot of the burial but it is our way of remembering this veteran who would other wise have been forgotten. After five years of research, on October 5, 2013 a monument was installed on site.